The American Road, Classic Thunderbird Club Int. We received a great note from the Thunderbird Club in metropolitan Detroit! 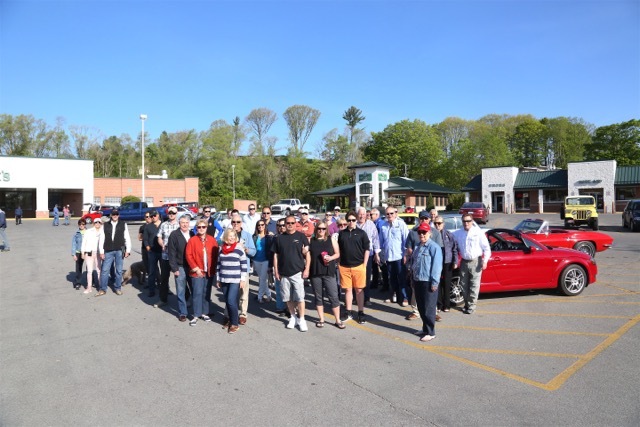 Here is a great group of car enthusiasts that joined us for a perfect day on our 2nd annual MFD Classic Motors Spring Road Rally! Our Rally through Leelanau County was met with Cherry blossoms, panoramic views and many great memories! Special thanks to Dean Carrol of Lemay Car Museums Club Auto, Lochenheath Golf Club, The Leland Lodge, Dan McDavid and TC Photo’s to name of few that made this event so special! On behalf of myself (Healey 3000), wife Dawn (Lotus S7) and our MFD Classic Motor Team we truly enjoyed a wonderful experience at Amelia. It not only went smoothly but the unusual run on the historic airfield site made it all the more entertaining. Your Team was once again on top and handled the conditions with class! For me personally, I thank you and Pam for parting with the event banner. It will hang with pride near my Bocar, pictured on the banner as it ran in 1960 on that very course! 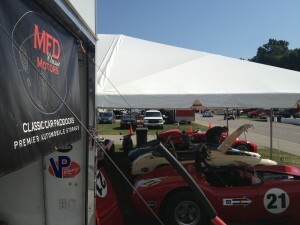 We are looking forward to see you all at Road America in May. Meanwhile, be safe, healthy and smile!! First week, the classic car hobby celebrated its seventh annual Collector Car Appreciation Day, a day staged under proclamation of the U.S. Senate, promoted by SEMA (the Specialty Equipment Marketing Association) and involving a series of car shows from coast to coast and border to border. And if you are fortunate to live in the right area, you could celebrate with Hagerty, the insurance and valuation provider, which again rolled back the clock by taking over a service station — this year an iconic structure in Beverly Hills, California — and offering a full-service fill up of your classic car’s tank at whatever the price of a gallon was when the car was produced. ClassicCars.com got into the celebration two ways this year, sponsoring a car show in Arizona and, for the second year in a row, asking you, our readers, to submit your nominations for the people who should be recognized as Classic Car Community Heroes or Heroines. Speaking of Beverly Hills, Jay Leno was nominated because of all he does for the hobby (much of it anonymously, or at least without any public fanfare) — and for the attention he brings to the classic car community. Ronnie Reed of Maricopa, Arizona, was nominated because he donated his dream car, a 1977 Chevrolet Caprice, to the Walk by Faith raffle to raise money for the construction of a new church and facilities to provide empowerment workshops, day care and pre-school facilities and a community food pantry and kitchen that will provide meals for children during non-school months. 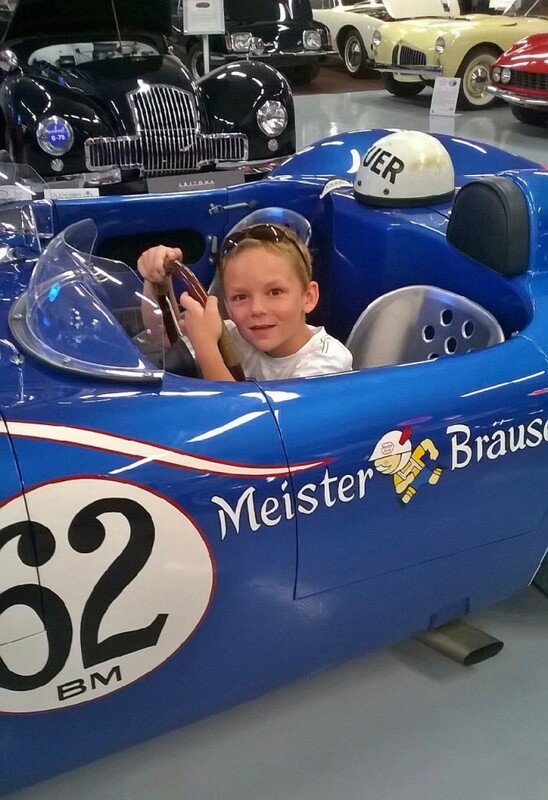 “On a visit there with my 8-year-old grandson, James, Dawn took the time to show and tell us about their prized possession, with stories of their racing experience, restoring old cars, history of some of the vehicles. 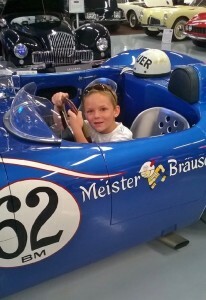 My grandson James is now an over-the-top car enthusiast. Dawn let him sit in a few of their classics while telling us about their history. Mike even gave James a cap of an Audi S4 (one of his race cars) and signed it. Above and beyond being kind to us, Dawn totally deserves this award recognition. 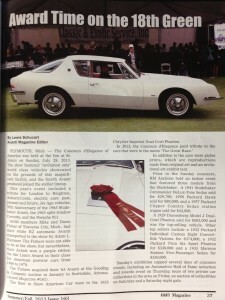 A great article in Avanti Magazine about the ’63 Avanti that resides here at MFD Classic Motors! PLYMOUTH, Mich. – The Concours d’Elegance of America was held at the Inn at St. John’s on Sunday, July 28t, 2013. The show featured “invitation only” world class vehicles showcased on the grounds of this magnificent facility, and the fourth Avanti produced joined the stellar lineup. This year’s event included a tribute for London to Brighton, Auburn/Cords, electric cars: past, present and future, Jet Age vehicles, 50th Anniversary of the 1963 Studebaker Avanti, the 1963 split-window Corvette, and the Porsche 911. AOAI members Mike and Dawn Fisher of Traverse City, Mich., had their white R2 automatic Avanti transported to the show by Adam L. Hammer. The Fishers were not able to be at the show, but nevertheless, their Avantu won a purple ribbon the Lion’s Award in their class for Americvan postwar cars from 1960 to 1970. 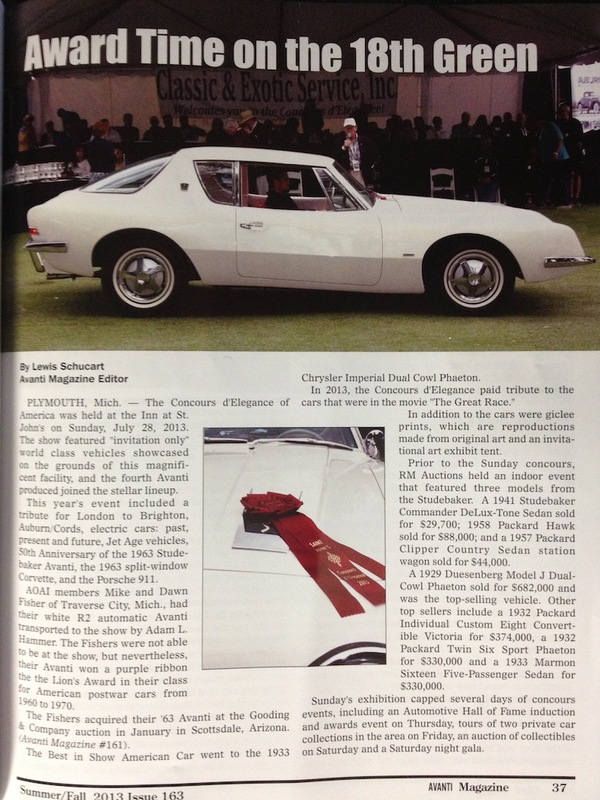 The Fishers acquired their ’63 Avanti at the Gooding & Company auction in January in Scottsdale, Arizona. (Avanti Magazine #161). The Best in Show American Car went to the 1933 Chrysler Imperial Dual Cowl Phaeton. In addition to the cars were giclee prints, which are reproductions made from original art and an invitational art exhibit tent. Prior to the Sunday concours, RM Auctions held an indoor event that featured three models from the Studebaker. A 1941 Studebaker Commander DeLux-Tone Sedan sold for $29,700; 1958 Packard Hawk sold for &88,000; and a 1957 Packard Clipper Country Sedan station wagon solve for $44,000. A 1929 Duesenberg Model J Dual-Cowl Phaeton solve for %682,000 and was the top-selling vehicle. Other top sellers include a 1932 Packard Individual Custom Eight Convertible Victoria for $374,000, a 1932 Packard Twin Six Sport Phaeton for $330,000 and a 1933 Marmon Sixteen Five-Passeneger Sedan for $330,000. Sunday’s exhibition capped several days of concours events, including an Automotive Hall of Fame induction and awards event on Thursday, tours of two private car collections in the area on Friday, an auction of collectibles on Saturday and a Saturday night gala.  Welcome to the new MFD Classic Motors website! Here you will be able to keep up to date on all that’s going on at our facility. Stay tuned for news about upcoming events, rallies, or some of our racing escapades from the vintage circuit! Follow us on Facebook for even more car related tidbits and fun!